With the Streetfighter, Harley-Davidson ventures into a new, aggressive territory dominated by the Triumph Street Triple RS, Ducati Monster 821, Kawasaki Z900 and Yamaha MT-09. Here’s what we expect from it. 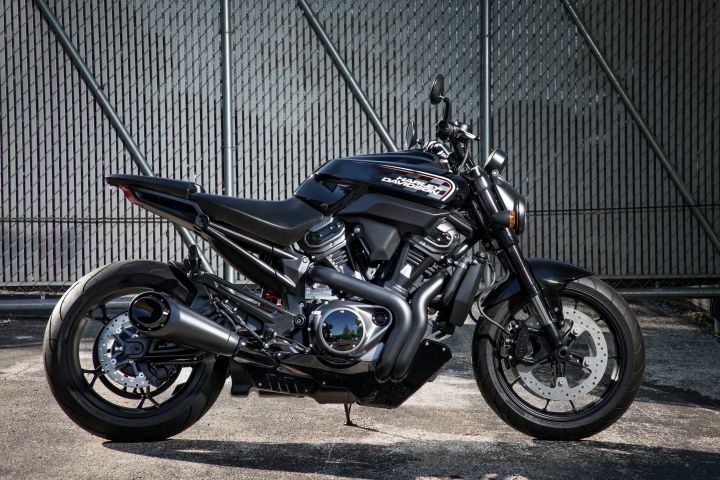 The Streetfighter seems to draw inspiration from the Harley-Davidson XR1200 upto some extent. Entering a segment ruled mostly by the Japanese, the Streetfighter looks like a thoroughbred street naked now. With minimalistic bodywork but an aggressive stance, it somewhat resembles the 2018 Honda CB1000R. To start with, the round headlight is all-LED, sitting atop which is a single-pod all-digital console. The handlebars with bar-end mirrors seem to be slightly higher set, which should offer a comfortable yet engaging stance. The fuel tank not only looks masculine but quite wide as well. So expect decent fuel-carrying capacity. The chequered graphics also remind us of the XR1200. The rider seat also looks broad and plush. However, while the split pillion seat isn’t broad enough, it looks longer than what the competition offers. The rear looks uncluttered with an LED tail light. We particularly liked the 5-spoke, 17-inch alloy wheels, finished in black. The stubby exhaust can with the gloss black finish balances the glossy paint job against the engine and mechanical components finished in matte black. Apart from looking cool, it should also help with better weight distribution. Speaking of the engine, it’s an all-new 975cc, liquid-cooled, V-Twin motor, which has been built from the ground up, as a part of Harley-Davidson’s all-new modular middleweight platform ranging from 500cc to 1250cc. The motor will be mated to a 6-speed gearbox, spinning the rear wheel via a belt drive. Power and torque figures are yet to be disclosed but expect it to churn figures at par with the competition - in the range of 120PS. Being a V-Twin, expect it to be torquey as well. While we are not too sure about Harley offering power modes with the bike, we do expect to see traction control and a slipper clutch. The engine on the Streetfighter acts a stressed member and seems to be housed in a trellis frame, with a separate alloy subframe. The USD front forks seem like a 43mm unit, while the rear comes with a vertically mounted monoshock. Braking will be managed by dual discs up front and a single disc at the rear. Expect ABS to be standard fitment. Going by H-D’s international launch trend, expect to see the Streetfighter in India around 6 months after its international launch in 2020. If the Streetfighter makes it to India via the CKD route, it is likely to be priced in the Rs 9 lakh to Rs 11 lakh bracket. While specifications are yet to be released, we can’t help but imagine the insanity the Streetfighter will bring with it to the naked litre-class segment (based on our experience with the Harley-Davidson Fat Bob). Also, since Harley-Davidson has pointed out that the Streetfighter is the first of its offerings in its new 500cc-1250cc modular middleweight lineup, we can expect more versions of it with smaller and larger capacity engines as well. Another cool Harley-Davidson venturing into the Adventure segment is the Pan America 1250. Launching between 2020 - 2022 it will compete against the Triumph Tiger 1200, BMW R 1200 GS and the Ducati Multistrada 1260. Apart from this, the American giant is also planning to venture into the 250cc-500cc segment with all-new motorcycle for the Indian market, which should make its way here in the coming two years. In order to make this possible, Harley is currently in talks to tie up with an Asian manufacturer. This should also ensure that the pricing is extremely competitive. That said, expect to see a glimpse of it at the upcoming EICMA motor show at Milan, Italy. Share your experiences with Streetfighter 975?